Researchers distinguish normal test results by performing the test in people who are well. For example, 100s of normal people will have blood tests done and the test results will vary over a narrow range. A serum potassium test result may be as low as 3.0 and as high as 4.0 in normal people, for example. An abnormal test result for potassium, then, is one whose value is greater than the highest in the range of values in normal people. But, the greater the potassium level, the more the diagnostic and treatment decisions may vary. In tesing, the magnitude of the result matters. A key concept in testing is that the value of any test result may vary. The more abnormal it is, the more information it “contains” in terms of making a diagnosis. This may seem self evident, but failing to consider the absolute value of a test result is a common cause of missing the correct diagnosis in my experience. The best way to understand this is to see an example. In the table below, I present a single test’s possible results. The test is PSA, or prostate specific antigen. It is a test used to find prostate cancer, but it is imperfect as the PSA test can be abnormal in diseases other than cancer. If a physician, or you, just considers the test result as normal or abnormal, you will lose information about the value of the test. In the table, a high value (30, for example, in the first column of the table) means something different to you than a value of 20, or 10, or 5, even though all of those values are abnormal (any value greater than 2 in this example would be abnormal). In the table, also, note that a test result value as high as 30 only occurs in people with cancer 1% of the time, which is a small percent chance. However, that level of the test never occurs in other diagnoses (in this example). Hence, a value of 30 means you have cancer. It is, in fact, a gold-standard test result at that level. 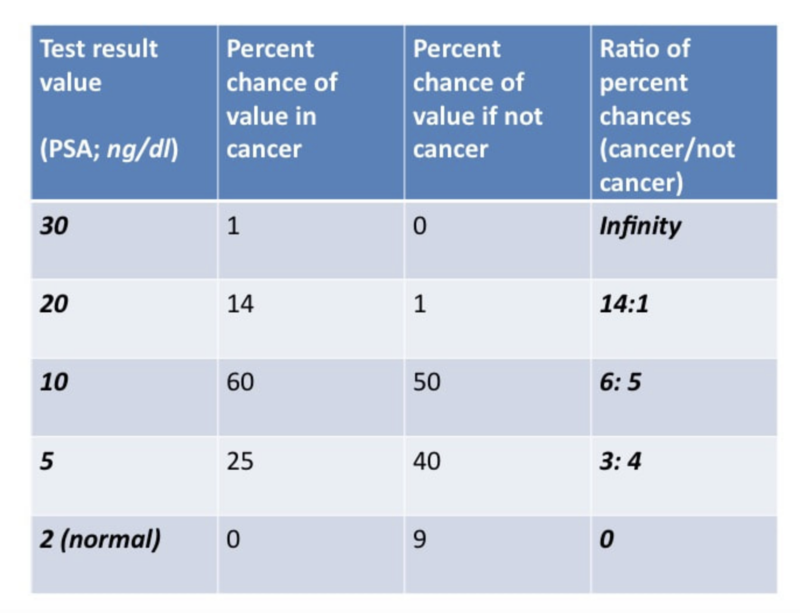 Any other abnormal test result value less than 30 in this example may increase the likelihood of having cancer, but those values do not mean for certain that you have cancer. You can see from this table, then, that the actual test result value will have different meanings in terms of making a diagnosis. When we get to actual case examples in future blogs, you will see situations where a diagnosis was uncovered just by considering the information contained in the actual test result value. My main point to you as a diagnostic decision maker is that you must know everything about your test results, including the exact value of every test’s results. Do not think of tests as just abnormal or not, know your test result values backward and foreword.